This brand new publication comes as a folded map showing the present state of the country. The map includes the new and former provinces, administrative boundaries, over 100 airport locations, the road and railroad network, rivers and lakes, major cities, towns and villages, nature reserves. Time zones, language areas and geographical co-ordinate grid are added. 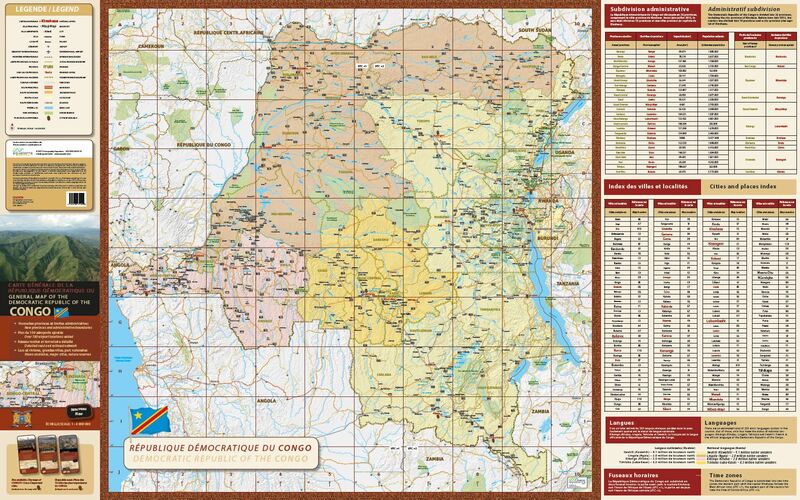 The new road map of Congo is an indispensable instrument for all organisations working in the Democratic Republic of Congo, as well as for travellers visiting the country. 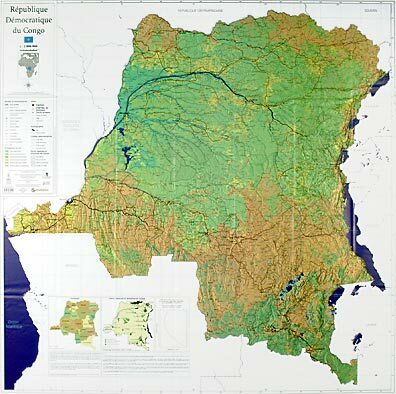 This unique physical map of the Democratic Republic of Congo has a scale of 1/2M. Available as a flat map as well as a folded map. This folded map shows the city plans of the 10 most important cities of Congo, after Kinshasa and Lubumbashi (of which separate maps are available). Kolwezi, Kisangani, Bukavu, Goma, Matadi, Kananga, Kalemi, Likasi, Mbandaka and Mbanza Ngungu. This unique folded map shows the city Kinshasa and region, the airport Ndjili, street index, list of place names, address information, touristic areas, churches, sports centres, museums, embassies, hospitals, hotels and restaurants. 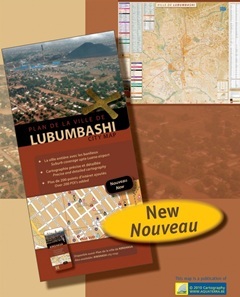 Following the publication of the KINSHASA city map, Aquaterra presents the first complete and detailed city map showing LUBUMBASHI, "Congo's economic capital". This brand new city map shows the entire city on detailed scale. Over 200 points of interest have been added (including contact information). Obviously, there is also a street name index added.